MAX, 1-160aa, Human, 01-1821 | ARP American Research Products, Inc.
MAX is a member of the basic helix-loop-helix leucine zipper (bHLHZ) family of transcription factors. It is able to form homodimers and heterodimers with other family members, which include Mad, Mxi1 and Myc. Myc is an oncoprotein implicated in cell proliferation, differentiation and apoptosis. In contrast to Myc, which is highly regulated during progression through the cell cycle, Max is highly stable and is much more abundant than Myc. Recombinant human MAX protein, fused to His-tag at C-terminus, was expressed in E.coli and purified by using conventional chromatography techniques. 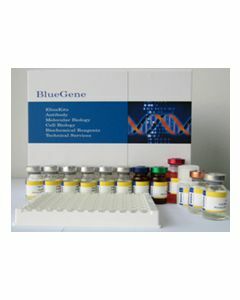 bHLHd4, bHLHd5, bHLHd6, bHLHd7, bHLHd8, MYC associated factor X Helix loop helix zipper protein, MAX protein, MGC10775, MGC11225, MGC18164, MGC34679, MGC36767, Myc associated factor X, Myc binding novel HLH/LZ protein, Orf 1, Orf1, Protein max. Burbano HA., et al. (2010) Science. 328(5979):723-5.